When it comes to selecting a riflescope, shooters have a bewildering choice to satisfy their every need: fixed or variable magnification, sidewheel or objective parallax adjustment, 25mm or 30mm tube… and so on. Obviously, reticle design is also an important consideration when deciding on a riflescope, but perhaps less obvious is the focal plane in which the crosshair sits within the riflescope’s optical layout. 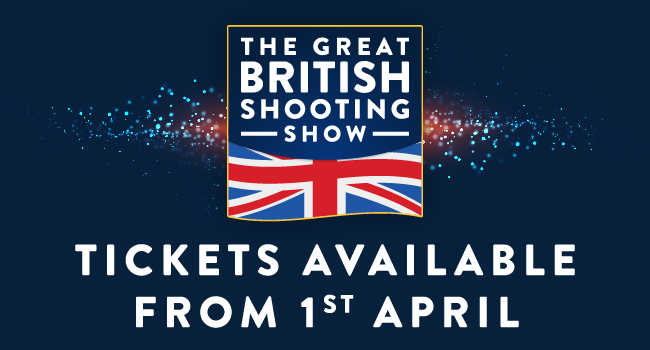 A riflescope’s crosshair can either be situated in the first focal plane (FFP) or second focal plane (SFP) – and as each offer significant differences on variable magnification (or zoom) scopes, it’s important to determine which type is best suited to your style of shooting. 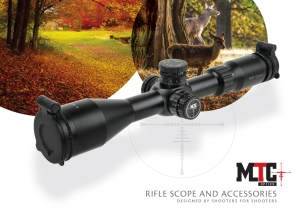 The majority of riflescope designs feature a second focal plane reticle as they’re easier to produce and keep costs down, but most quality scope manufacturers now offer FFP scopes in their range like MTC Optics’ new Cobra F1 model. Both SFP and FFP scopes have their merits, so to help you make an educated decision when choosing your next optic, here’s a guide on each type. Sometimes referred to as ‘rear focal plane’, SFP scopes are by far the most common type. 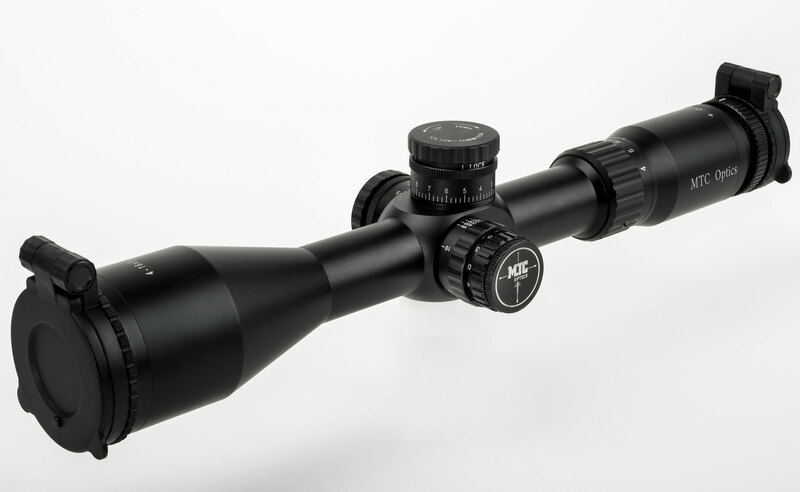 Their construction is such that the crosshair is placed behind the lens group that determines the scope’s magnification. In the case of variable magnification scopes (eg: 2-12x or 4-16x), this second focal plane position means that the size of the reticle does not change as the magnification is altered. Only the target appears bigger or smaller as the scope is zoomed in and out, which means that on multi-stadia crosshairs, the relationship between the aim-point references on the reticle and the target will be different depending on the magnification setting. For example, the distance between two aim-points on the crosshair may equate to 4ins (10cm) on a target when it’s viewed at 4x magnification, but only 1in (2.5cm) when the scope is zoomed up to 12x magnification. Of course, the centre point of the crosshair should not, in theory, deviate when the magnification ring is rotated, although it often does on the cheaper scope models! However, if you use multi-stadia crosshairs like the MTC SCB2 to allow for ‘holdover’ or ‘holdunder’, then you must be aware of this target/crosshair relationship change. 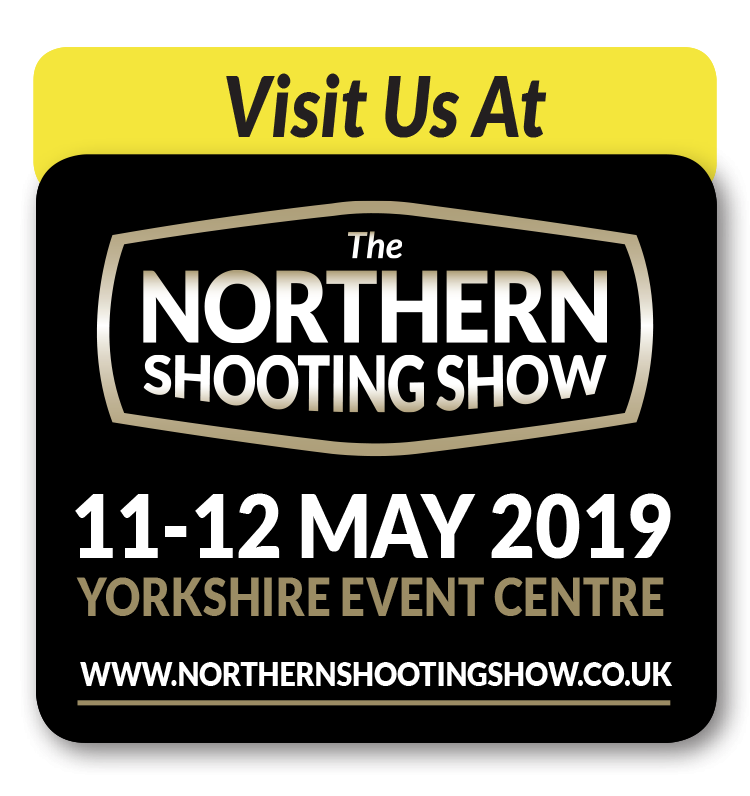 It is therefore best practice to familiarise yourself with the aim-point/trajectory relationship by only shooting on a specific magnification, like 8x. This begs the question: “Why choose a SFP vari-mag scope, then?” Well, a zoom magnification feature is still a very handy feature to have, perhaps for spotting purposes where higher powers allow you to seek out a clearer sight picture. 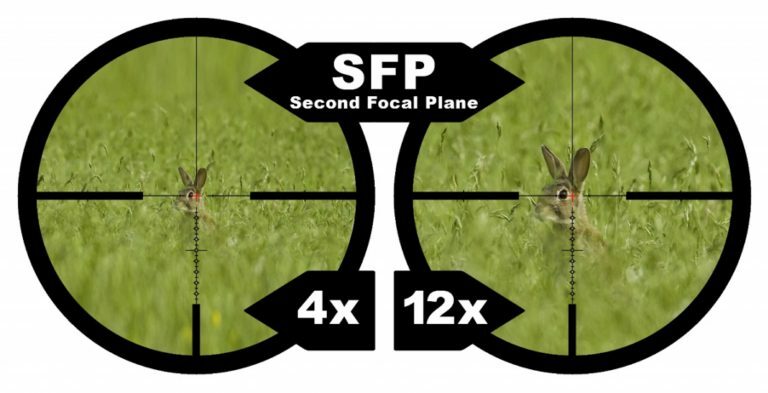 And many shooters also like to use SFP reticles for ‘bracketing’, where ranges can be estimated after having predetermined what distance the gaps between reference points equate to at each of the scope’s magnification settings. Although it requires some initial working out, reticles like MTC’s SCB2 and AMD can provide a very practical method of quickly estimating (or checking) range while taking aim. 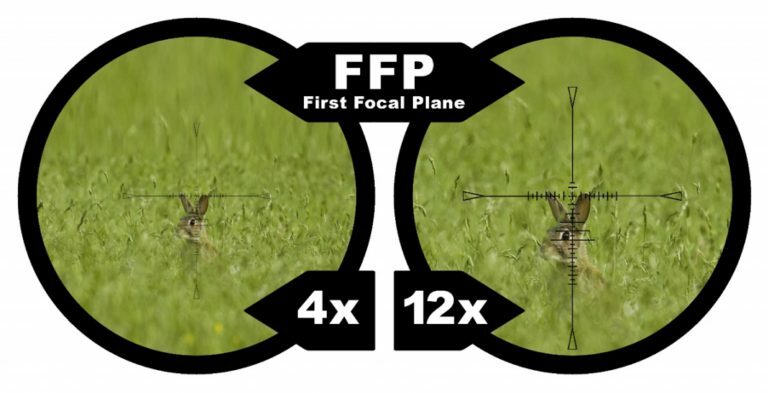 Sometimes referred to as ‘front focal plane’, FFP scopes are usually more expensive by virtue of their more complicated construction, where the crosshair is placed in front of the lens group that determines the scope’s magnification. In the case of variable magnification scopes (eg: 2-12x or 4-16x), this first focal plane position means that the size of the reticle will appear bigger or smaller, in line with the target image, as the scope’s magnification is zoomed in or out. Therefore, with graduated crosshairs, the relationship between the aim-point references on the reticle and the target will always remain the same, regardless of the magnification setting. For example, the distance between two aim-points on the crosshair may equate to 4ins (10cm) on a target when it’s viewed at 4x magnification, and it will still be 4ins (10cm) when the scope is zoomed up to 12x magnification. This makes life a lot simpler if you use multi-stadia crosshairs like the MTC SCB2 to allow for ‘holdover’ or ‘holdunder’. Why? Because you can shoot on any magnification setting without worrying about a change in the aim-point/trajectory relationship. There are a couple of points to remember with FFP scopes. Because the reticle size alters with the magnification, the crosshairs will appear thicker at the higher powers and thinner at lower powers. Also, you cannot really use the ‘bracketing’ system for range-estimation. However, as bracketing data is quite long-winded to initially set-up, many shooters prefer to acquire the target’s distance using either a laser rangefinder, like the MTC Rapier Ballistic, or (on higher-powered scopes) the scope’s onboard parallax adjustment facility. We hope this helped but ultimately the choice is up to you.